WeekApp is a potentially unwanted program that our security research team classifies as adware. This application adds extensions to all main web browsers, but it should be pointed that Google Chrome automatically blocks WeekApp, saying that it is a suspicious application. It should be enough to convince that nothing good can come out it. You ought to remove WeekApp from your system along with other unwanted programs that you are bound to have on your computer. Your system security should be your utmost priority, so you need to run regular system scans with licensed antimalware tool to ensure computer system’s stability. WeekApp belongs to a group of adware applications that are known as InstalleRex-WebPick family. Programs from this group are known to randomize their name upon the installation. 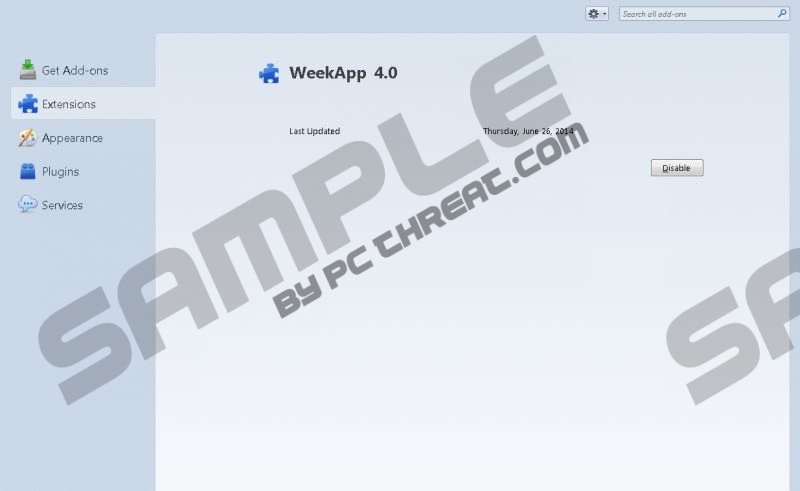 WeekApp is of no exception – WeekApp’s entry on the list of installed programs could be randomized as WeeKappp, WeekaPp and so on. The official website at weekapp.net claims that WeekApp is supposed to help you find the best Android and PC apps on the web, but the chances are that this program may cause a lot of problems than do any good. Since it is an adware application, it displays commercial advertisements that can impede your online browsing process and expose you to potentially corrupted third-party websites. Now you might say that you do not remember visiting weekapp.net and installing WeekApp onto your computer. It is most probably true, but users seldom download adware from their official homepages in the first place. The main adware distribution method is bundled downloads. WeekApp can also be bundled, and it usually comes with fake Flash player or Java plug-in installers. Such installers are abundant on the Internet – users often encounter annoying pop-ups that encourage downloading and installing new upgrades for plug-ins and media players. Needless to say, that if you need to update your flash player or media player, you have to download the updated at the official homepage. Trusting third-party websites is a bad idea – you will simply download more adware onto your PC, thus making your system vulnerable to a third-party exploitation. It is highly possible that you have installed WeekApp onto your PC yourself, but do not panic – even if you have more than just one adware application on the system, it is not hard to get rid of them. You can remove WeekApp via Control Panel and then look for other unwanted programs to remove. If you do not know which programs have to be deleted, scan the PC with SpyHunter free scanner and all the potential threats will be detected at once. Terminate all the unnecessary and potentially malicious applications from your system, and invest in a powerful antispyware tool that will protect your PC from harm. For any further information, do not hesitate to leave us a comment. Highlight WeekApp and click Uninstall. Go to Uninstall a program and remove WeekApp. Press Windows key and navigate to Control Panel. Select Add or remove programs and uninstall WeekApp. Quick & tested solution for WeekApp removal.